The final episode of NCIS Season 11 was a perfect vehicle to honor the memory of Ralph Waite, who played Gibbs' father, a man we've seen too little of over the years. 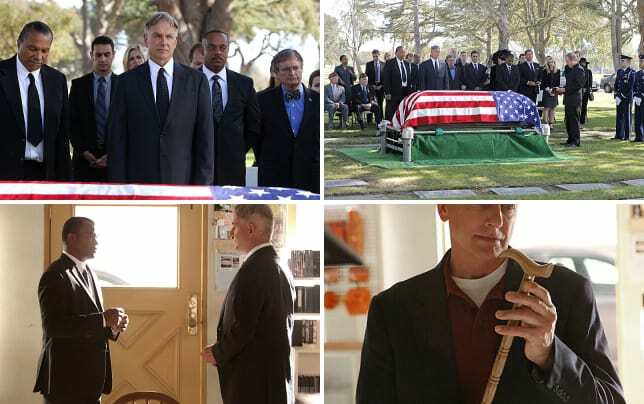 NCIS Season 11 Episode 24 also provided a heck of a glimpse into Gibbs' character and how he handles grief. Whereas Vance needed those two months off to process his wife's murder, Gibbs' catharsis is work. He summed it well when he told Vance: This job. It's all I have. I feel sad for the man. While his passion for his work is obvious, the absence of a partner to share his life with seems stark. Maybe it's too late for him. Maybe he's been doing the work for too long. Perhaps he wouldn't welcome any major changes at this point. Good on the writers for not only handling Jackson's death in a nuanced manner, but in providing an exciting NCIS criminal investigation story to go with it. For a while there, it seemed like this was going to be a season cliffhanger, with Gibbs' life in the balance. So there was some relief when they managed to tie up all of the loose ends toward the last part of the hour. The revelation that the arson and escape attempt was all about Gibbs. Parsa's old gang and Rivera wanted to move heaven and earth to get revenge on him. The realization that Lateef Mir was not your average run of the mill terrorist, that he had gone to great lengths to provide some misdirection through some false DNA. 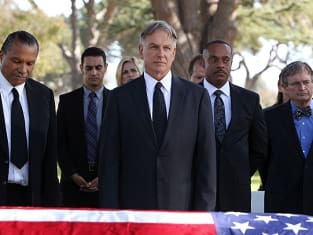 I always like it when NCIS faces a truly challenging enemy like this. Of course, no enemy is a match for Abby's incredible forensic skills. There were two face to face confrontations that stood out as electric: the first happened between Gibbs and Vance. These two guys have been without rancor since the death of Vance's wife, backing each other up and supporting each other. The depth of their love for each other really came through strongly with their head-butting scene. Vance just wanted some peace for Gibbs so that he could mourn, while Gibbs just wanted to get back to the only thing he loves in life, the only thing left to him now: his job. I guess Gibbs won that one, since his next scene - the confrontation with Rivera - would have meant he had gone directly against Vance's orders to go on administrative leave. Alejandro: You think I'm dirt? You think my father was dirt? Permalink: Just so we're clear. I really liked that whole scene, particularly when McGee showed Rivera the footage of what had to have been a drone strike against the remaining leadership of the Brotherhood of Doubt. The most poignant part of the finale was the final photo just before the credits of Mark Harmon and Ralph Waite, arm in arm in front of a car, with the caption "In Memory of Ralph Waite. A Gifted Actor and our Friend." The song playing in the background was Warren Zevon's "Keep Me in Your Heart." Palmer and Breena are going to not only have their own child, but they're going to adopt as well! Bishop showed understanding and compassion with her suggestion that the team share their memories of Jackson Gibbs with her. Gibbs has a new after-work project. It looks as though he is going to re-create the toy boat he and his dad worked on, only on a much larger scale. Seems doubtful that we've seen the last of Alejandro Rivera. A man that full of all-consuming hatred - with the finances he still controls - won't stop until he or Gibbs is dead. There were a lot of great scenes in this final episode. Which was your favorite?